It's been a little while since I've done a hair tutorial. I snapped this just before I cut may hair a couple of weeks ago but will endeavour to do some mid-length hair tutorials in the coming weeks. To do this style, you need 2 hair elastics and bobby pins. As usual, I find this works on day or 2 old hair. Freshly washed hair will be too flyaway. STEP 1 Section your hair in half and tie each section into high pigtails toward the back of your head. STEP 2 Separate a pigtail in two pieces. Twist each piece in opposite directions and then twist the two pieces together (you can do a plait if you find this step too tricky or have fine or freshly washed hair). Secure at the end with a bobby bin or elastic while you repeat on the other side. STEP 4 Remove your bobby pins or elastic from the end of each pigtail. Then wrap your pigtails together and secure with bobby pins. Once you have your hair pinned securely, use your fingers to slightly loosen the twists for a look that's a little more undone. Spray with hairspray to hold. Now this has me cursing the fact i cut my hair!!! You make it easy! I can't seem to get the twists to stay in place long enough to wrap them together before all the hair starts falling out. Very pretty idea, but didn't work for me. You need to twist both halves in one direction (clock/anticlockwise) then wrap them around each other in the opposite direction and bang the elastic/pin on the end of that sucker and it should stay put for you. It's called a rope braid and there are heaps of tutorials on U-Tube for how to do it. This is not an "easy" twist. :( I tried it several times. You make it look so easy to do. :) Thank you for sharing. She fails to mention that it does not work if you any kind of layers in your hair. I have long layers and a fringe that's growing out. You can see my shorter layers in Step 1 pic. I guess it depends on how short your layers are? Get as much of your hair in the bun then pin the fallen shorter layers in. This is cute, it's a contender for my nieces hair for her Snow Ball, Thanks for the tutorial! Woo hoo. Can't wait to try it on my daughter! I have REALLY long hair and have seen hundreds of tutorials for these cute messy/braid buns and it just never seems to turn out, almost like I have too much hair. A lot of these seem great but I guess you can't have hair longer then your shoulder blades.... Is anyone else having this problem, because it's kind of infuriating! I have wavy hair that is down to the middle of my back and it worked fine for me today when I tried it out. You just have to wrap the hair around a little more than is shown and it should work out fine. I don't get how the whole twisting them together at the end works out. I know someone already asked and that there was a reply but it is still unclear and isn't working for me! I agree! I just tried this on my daughter and it was not working at all. The 4th step is NOT explained well at all. I tried it this morning and basically, I just twisted my two already-twisted pony-tails twice, and then pinned the right end to the left side of my head and vice versa. More details would be helpful. Yes, more details I n the fourth step would be great. I just winged it but not the same. Would like to know where I'm going wrong to fix it. It it super simple IF you already know how to do twists. 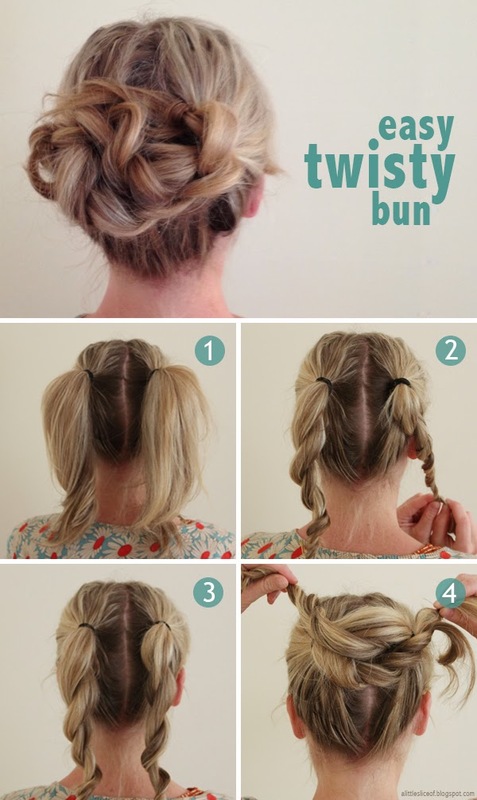 The other ladies are right, you take two strands, twist them opposite, and wrap them around each other to make a twist. YouTube helps. I only know because my hairdresser showed me. I'm Lauren Gordon of CafeMom and I'm doing a round-up of the easiest "lazy girl" and would love to include this. We will of course provide link backs and credit. Please let me know! Follea's Gripper Collection is especially popular among women with Alopecia Areata and others who have little to no hair. The Gripper-2 is light, breathable, stays securely in place with affixed medical grade silicone tabs and does not require tape or adhesives that can cause adverse skin conditions. Thanks For Sharing Great Post. I really appreciate it. Keep it up. © 2012-2016 Carla Salsone and A Little Slice Of unless credited otherwise. Contact me for use. Powered by Blogger. © A Little Slice Of. All rights reserved.